Part two of the famous Berlin trilogy is one of the few albums, and by extension the title track, to be put in quotations. As Richard Dreyfus said in Close Encounters of the Third Kind, “this means something.” Recording in the German city which featured the infamous Berlin Wall can have profound effects on one’s art, and this is precisely the effect that was both desired and resultant. The bleak cold war atmosphere leaked in at every pass, and the combination of the location, the production of Brian Eno, and the companionship of Iggy Pop all led to the production of not only a fantastic and legendary album, but also one of the greatest, most anthemic songs in history. A good portion of the album, like Low before it, is made up of experimental instrumental pieces that would confuse some and impress others. Kraftwerk and World War II played dual roles in influencing the song “V-2 Schneider,” being both a reference to the German bombs dropped on London during the war, written about to perfection in Thomas Pynchon’s “Gravity’s Rainbow,” and to Florian Schneider, one of the musicians in the band Kraftwerk. Bowie and Eno then go on to play “Sense of Doubt,” “Moss Garden” and “Neukoln.” “Moss Garden” features Bowie playing a Japanese Koto, an evocative instrument that puts us in the Japanese middle ages, meditating in a rock garden, protected by samurai. “Neukoln” is the Turkish quarter of Berlin where Bowie found much sadness and isolation, which is saying something in the Cold War days of Berlin. Bowie’s sax is at times reminiscent of Middle Eastern influence and at others of free-form jazz. The combination makes for a stark piece. The avant garde musician and composer Philip Glass went on to make symphonies from the instrumental music in both Low and “Heroes”, and that step was an easy one to make. The first half of the album is the one with most of the vocal pieces, the exception being the closer, “The Secret Life of Arabia.” “Beauty and the Beast” is derived from the old folk tale, now Disney-ized in most people’s minds, but Bowie evokes the old school feel, dark, foreboding and dangerous. “Joe the Lion” features the singer at odds with his usual crooning, this time shouting out lyrics in a desperate fashion. “Sons of the Silent Age” is thought to be either about the growing emergence of punk or about the middle aged businessmen on the subways in Berlin. The lyrics tend to favor the latter and the ages of the businessmen would tend to suggest they were born in the silent age of film. The song tells of men with blank looks who “never die they just go to sleep one day.” The chorus sounds a bit like the bridge of “Quicksand,” while the tenor of his voice in the verses sound like the future songs Bowie would produce in the ’90s and ’00s, emphasizing a British accent as he does in the song “Little Wonder.” In this way, “Heroes” is an album straddling the divide between two separate ages. The title track alone could rate an entire review, and probably has already (ed note: Didn’tcha see our Best Songs Ever of the 70s?). Starting mid-stream with Eno’s keyboards and Fripp’s wailing guitar, Bowie then enters with clear and almost spoken lyrics. He tells a story of two lovers who meet at the Berlin Wall, defying the guards at the gun turret, making their love into something “heroic.” Others, some who were there in Berlin with Bowie, claim that the man at the wall is Bowie himself and that his tryst at the Wall was in fact more “heroic” than his hollow life as a rock star. He supposedly felt strangely at odds with the idolatry his fans loaded on him. Thus, the song and album title is in quotes. 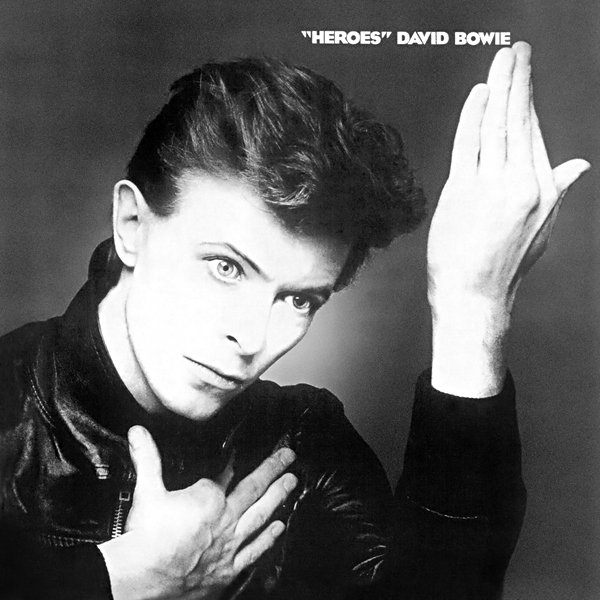 “Heroes” is meant somewhat sarcastically, except within the imagination of Bowie and his song characters. When the second chorus arrives, the emotional level escalates tenfold, with Bowie starting to scream out his lyrics, which make the recording technique Bowie used, if not apparent, then stunningly magical. Microphones were set up not only in front of Bowie, but one ten feet away and another between twenty and thirty feet away. Each were fronted with “gates” that would open the microphone when a sound was “picked up.” And so, when Bowie’s voice gets louder, the “gates” open up and create a resounding echo effect. That, added with the backup vocals which begin with “over our heads,” help create one of the most emotive anthemic love songs ever recorded. The Wallflowers covering the song for, of all things, the Godzilla soundtrack, proves only that you don’t mess with anthems. Bowie began a highly productive period in 1977. His first collaboration with Eno was released early in the year. He then produced The Idiot for friend Iggy Pop, started recording the tracks for “Heroes”, and lost two friends in Marc Bolan and Bing Crosby, both of which he had just finished working with, Bolan on his television show and in the studio, and Crosby on the now famous duet of “Little Drummer Boy / Peace on Earth.” Bowie was now free of drugs and artistically motivated. Punk was beginning in both America and in England, and all the while, the practical “godfathers” of modern music were all holed up in Berlin. Let’s just hope that a Berlin movie theater picked up Star Wars for them.